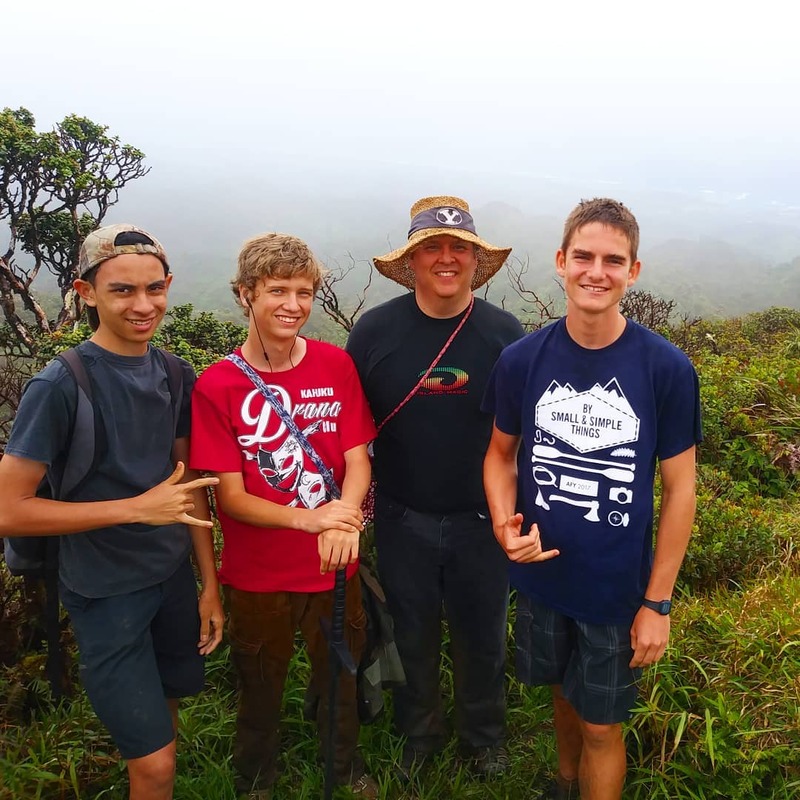 A few months ago, my 16 year old son got the idea to take some friends and hike the Laie Summit Trail. I'd been to the falls several times and had seen the sign that points to the right for the falls and the left for the summit. Of course I wanted to see what was over in the other direction from the falls, and hiking to the top of the mountains that I can see out my front door every day? Awesome. The first date we planned for the hike got rained out. Today we woke up to partly cloudy skies and a chance of rain. I could see the tops of the mountains, so we decided to go. While looking around online I had a hard time finding something that told us exactly how long the hike would take. So here's the breakdown. We had two adults and three teenage boys on the hike. We all like hiking, but we're not avid hikers. People who are conditioned for 12 miles and 3600 feet of elevation could probably do it faster. 4:50 PM - arrived home. Walking from our house it was nearly an 8 hour hike. If we'd driven to Cricket Field, it would have taken 7.5 hours. Above Laie Falls we had to push through undergrowth, wade through mud, and jump over a few washed out sections. It was never hard to find the trail, though. I was glad I wore jeans and had a long-sleeved jacket. Once I stepped in a washed-out place that was hidden by ferns and sat right down on the trail with one leg hanging over a cliff. Just keep your eyes on the trail when you're moving and watch out for gaps and holes. The forecast was for mostly cloudy with a chance of rain. As we got near the summit we climbed up into a cloud. It rained on us for only a few minutes, but that was enough to get us soaked and make it uncomfortably cold in the wind near the top. When we reached the summit and the ridge trail we went up the hill and found a nice spot to sit and eat lunch. While we were at the top it cleared off enough that we got a good view of Laie, and could also catch a glimpse of the surf on the Haleiwa side. We had cell phone coverage most of the way. I sent my daughter a text at the top, and also checked the weather radar and our exact location on google maps. Next time I want to go when it hasn't rained for a week, and when the forecast is for clear skies. That should make the mud less and the view more.